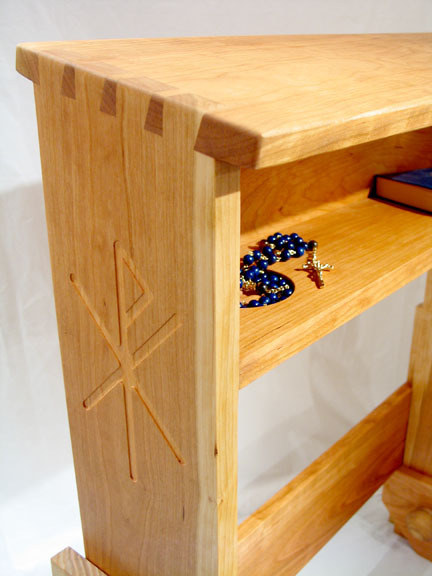 This humble stool is an excellent complement to a home altar or prayer area. Portable, strong, attractive, it is built at a proper ergonomic height for most adults. Please select from the following options to complete your Monastic Stool. All figures are estimates based on our latest materials, labor and freight expenses. It is unusual for us to have to change any costs except in the case of special shipping or design needs. Side Icon: We can add a cross or another icon into each side of this workpiece. We do this through a heating method that actually burns the image into the wood (and so is not as visible on dark woods like walnut -- on all other woods the icons are quite clear). We can also route/carve the icon image, if you prefer.